Karen Elaine Cook - 1st Priority Mortgage, Inc.
Karen started in banking in 1976, and completed Citibank's management and professional sales training programs to prepare for a career in Mortgage Lending. She is dedicated to providing the highest level of professional service in the business of Mortgage Lending. 1st Priority Mortgage offers a complete product menu of conventional, government, and first-time buyer programs. We also offer onsite underwriting, mortgage prequal letters, pre-approvals, and always provide competitive pricing. 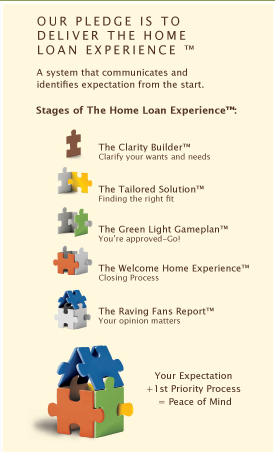 Be sure to ask about The Home Loan ExperienceTM!